"Draconian sanctions are ineffective and have no chance," says MK Moses. Hareidi Knesset Members are up in arms over the recommendations for enlistment of young hareidi men to the military, which are to be approved by the government in its next session. 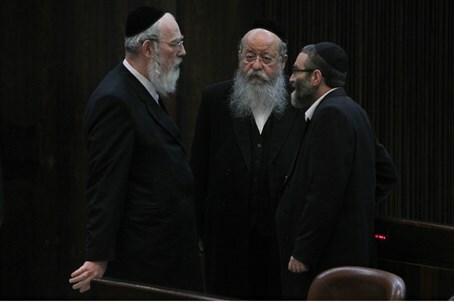 "The bill is divorced from reality and will not be implemented, of course," predicted MK Yaakov Litzman (United Torah Judaism). "Anyone who speaks about limiting Torah learners, setting a goal for top yeshiva students and quotas, exhibits ignorance in this ever so sensitive and complicated matter, as well as a patronizing and supercilious attitude." "We have guarded Torah students throughout the generations, and today, too, there will not be a situation in which a person who wishes to study Torah in Israel finds himself in jail or paying fines," he vowed. "The hareidi representatives did not take part in the Perry Committee deliberations, because of the clear aim of the Lapid-Bennett government under Netanyahu, is to harm Torah students, to place limitations on a huge and central sector of Torah observers, in the guise of caring for equality in sharing the burden of military service." MK Menachem Moses (UTJ) also declared that "There will not be a situation in which a Torah student finds himself in jail or threatened in one way or another. We will not be cowed with forced legislation and draconian sanctions. This is a bill that was born of complete ignorance and misunderstanding of the hareidi sector, and a hatred of religion, and its entire aim is the uprooting of the values of Judaism and religion. We are loyal to the instructions of the Great Sages of Israel and they will tell us how to act." MK Meir Porush (UTJ) said that instead of creating ministerial committtees to discuss hareidi enlistment, he would have expected ministers to discuss why secular education leads youths "to murder, steal and more... deeds that a hareidi Jew is ashamed to even speak about." "Let whoever has a part in this wretched law, which is an attempt to crush the Torah world, know that the future of our existence here in the Land is in danger," he said. "I call on the Bayit Yehudi rabbis - it is not too late, do not lend your hands to this harsh blow to the Torah world and to the holy yeshivas that are the soul of the Jewish nation." The Perry Committee on equal IDF service for all on Thursday filed its recommendations with the government. The law proposed by the committee would allow for up to only 1,800 top yeshiva students to remain fully exempt from service for as long as they were in yeshiva. Others would be drafted at age 18, but can defer service for 3 years. The committee recommended that the changes go into effect 3 years from now. Individuals who do not report for the draft will be criminally prosecuted. Yeshivas that encourage their students not to register for the draft will be punished by losing their state funding, while yeshivas with a high percentage of draftees will be rewarded.